Introduction: Climate change, its existence, causes and effects, has been disputed by researchers, academics and policy makers. The given degree of international consensus varies greatly between those most affected by changes to climatic conditions in contrast to those who are estimated to only experience a limited effect. Controversially, it can also be claimed that some regions are set to gain from climate change such as the polar region nations currently disputing resource claims and logistic networks. In analysis of available data, research suggests the increased intensity of storms, hurricanes, cyclones, flooding, droughts, bushfires, mudslides and hailstorms along with increased temperatures, rising sea levels, and changing to pressure systems. With climate change as a global phenomenon, not isolated to a certain region, the interest of stakeholders remains strongest in those with the ‘smallest’ voice such as the coastal areas, islands, commonly catastrophe prone and ‘future’ catastrophe prone regions in South East Asia. The re-insurance industry does not have the luxury of time in which to debate the ‘possibility,’ of climate change but rather to focus on the ‘probability’ of the consequences. With the cost of natural disasters predicted to rise exponentially in coming decades, the issue of human security is measured in economic terms. The economic effect of climate change is vague with popular measures of market costs, changes in quality of life, lives lost, species lost and variations in cost distribution and subsequent benefits. These costs are summoned into willingness to pay (the readiness of people to exchange their capital or income for improved human security) and willingness to accept compensation (the amount of compensation needed to see inhabitants forgo certain standards and accept deteriorating conditions). With 2005 noted by the insurance industry as holding the highest economic loss (USD $230 billion), the economic implications of natural catastrophes is apparent holding 2-9% of GDP in aggregated monetized damage. As 1-1.5% of this aggregated monetized damage occurs in OECD nations and 2-9% in developing nations the interests of regional stakeholders can be distinguished according to strength of climatic conditions on their area. In response, the re-industry has moved to new catastrophe modeling systems, developed new insurance products, flaunted ‘green’ initiatives and created new defenses against climate-related claims in order to analyse and more effectively assess the probability of risks and integrate problem solving mechanisms. As in all industries, re-insurance is a case of supply and demand with dominant players holding the reins of the insurance industry to mitigate larger risks by providing financial backing, reduced exposure to insolvency, and stability due to the geographically spread risk. The North American market has long been the most strongly insured of the regional global markets with the Asian region seen as the rising star due to the increased economic development and subsequent demand for insurance. Depending on the region, insurance coverage as well as government relief funding, will be limited in relation to the location’s level of risk. As the South East Asian region hosts increasingly prospering nations, situation in medium to high risk areas for natural disasters, the risk must be carefully calculated; after all, it is a business. This region holds a high propensity for natural disasters including earthquakes, tsunamis, flooding, mudslides, and storms whereby currently effected regions are expected to be joined with newly affected regions due to global warming. Whilst the economic imperative is addressed through the continuous revision of insurance policy and claim trends, the question of ‘protection’ remains. The role of insurance is that of a safety net; to catch those who stumble and fall in situations which could not have been circumvented. With the individual and the community at the centre of the human security issue the issue prevails; who will catch them when they fall? Human security surpasses traditional notions of security to comprehensively include environmental, political, social and economic aspects. In the case of environmental security, the threat thereto is not isolated to a particular individual or community, but rather an intensified affected core with global repercussions. Risk management, as in the case of insurance risk, credit risk, market risk, and operational risk, is the cornerstone of re-insurance with underwriting controlling the limits of insurance and identifying information such as in the case of natural catastrophes and environmental threats. Re-insurance is not a philanthropic concept or support network, but rather an industry interdependent with the global economy and market trends whereby weakened global financial markets and investor pessimism are critical factors. The re-insurance industry, particularly internationally, is marginally transparent with the safety net not extending to all areas. The series of ‘no-go zones’ demonstrates the economic imperative and business rationalism which conducts the insurance, and indeed protection, of regions. The ‘no-go zones’ are specific geographic regions considered too ‘high risk’ for re-insurance and subsequently insurance companies to insure. Thus, the plight of these areas is dependent on effective fiscal policy and a strong national welfare system to mitigate risks associated with climate change. In the case of the South East Asian region, particularly in coastal areas and islands, the ‘no-go zones’ will have a profound effect on human security as inhabitants seek protection and welfare support. From this it can be suggested that environmental peril may be grounds on which seek and be granted asylum. This may lead to new migration trends and subsequently strain inter-regional relations, immigration policies and welfares systems as well as setting precedents for future ‘no-go zones’ and other un-protected areas. The economic paradigms dominating the global must be considered in relation to the interests of human securities by examining the re-insurance market and the implications for humanitarian issues in the South East Asian region and subsequent international policy development to cater for social developments. The urge to circumvent risk is primal, with physiological needs and the ability of humans to ensure that these are met in the unforeseeable future allowing for development. Arguably, the storage of food, the establishment of multiple shelters, as well as group cohesion are all instinctive methods of insurance. These efforts to act in counterbalance of external factors or unsure elements are not only true for mankind but also for flora and fauna; security is primal. As Maslow suggests, the desire and indeed need for security runs a close second to our innate physiological needs with self actualisation as the ultimate motivation (Mitchie, 2001). When considering human development from the early groups and tribes to civilizations, it is evident that the cohesion was security, prior to fulfilling the need for belonging. These groupings for security lead to protection against natural elements, predators, or unforeseeable events such as fires. In essence, insurance is the management of risk or possible negative consequences based on the probability of these occurring. The origins of insurance developed in correlation with civilization as the rise of economic activity through trade and organized social welfare systems asserted the need to manage risk. Ancient welfare systems catered to the risk associated with death through the development of charitable or benevolent societies. However, the structures of these are limited in links with current health or life insurance systems. With the development of structured societies and law, the concept of insurance as it is known today, emerged. The greatest developments were trade and property. Economic implications for civilizations grew as trade flourished, with merchants developing systems to protect their goods from potential loss. In consequence of trade, the development of marine insurance became the first systematic insurance form, due to the enormous economic implication of lost cargo as well as the high risk environment of the freight. The seas and waterways have historically been considered an area of ‘danger’ or risk, often associated with legends and myths whereby man and his mission were at the mercy of the water. Another key element which affected the need for insurance is fire. As property became synonymous with the ability to address physiological needs as well as security, belonging, and esteem through status objects, the risk of fire critical. Although fire was the essence for warmth, living, and often working, its misuse or mismanagement could lead to significant problems and therefore posed a constant, unpredictable, threat. Indeed the idea of insurance as it is known today was largely developed in Britain and Germany, before spreading across to the United States whereby regulation regarding insurance for fire, property, marine and health with of World War II seeing a rise in Multinational Enterprise insurance (Wilkins, 2009). The concept of insurance relies on the idea of ‘risk,’ and the probability of this risk indeed occurring. However, prior to complex mathematics and statistical analysis, the risk could not be adequately assessed with the likeliness of the occurrence as well as the extent of the consequences being discussed through personal perspective and agreed on through consensus. As ideological beings, humans have attempted to explain life, the world and its meanings through various ideologies, belief systems and religions. Whilst prayer and worship were often used as a means to mitigate risk, economic and social insurance strategies for security were developed. However, the concept of risk may not exist if one’s ideology suggests that indeed all chances, losses and gains are for a specific purpose or destiny determined by a greater power. Life insurance is a further ideological contrast, as life is given a sum of its worth in monetary form. This commodification of life was rejected as unethical in Europe during the abolitionist movement. However, the critical element of property and security emerged in later years with the benefits outweighing ethical considerations. In some cases, insurance and subsequently reinsurance are against ideological constructs with some community or religious groups therefore refute the concept. The Amish community displays distaste for insurance, suggesting it is the role of the community and church to work together and ensure common security. For this reason, the Amish community reject insurance as well as social security which is a stark contrast to the insurance driven United States of America and a paradox to the security networks for which it strives. The idea of risk management through insurance is considered illicit as the community is to take care of one another and thus does not need ‘insurance’ as it is commonly understood if the community is following its religion wholeheartedly. This can be seen in the Muslim faith whereby Al-Gharar (Uncertainty)and Al-Maisir (Gambling) as well as Riba (Interest) are associated with common conventions of insurance and therefore are not in accord with the Islamic law (Mayasami & Williams, 2006). Help protect the community from the negative impact of adverse circumstances. Improve quality of life through the peace of mind that comes from security. Save and invest money through a shared system that distributes profit on premiums invested by policyholders on an annual basis. The Muslim system of Takaful may be considered insurance in theoretical terms with the involvement of a common finance pool to allow members to bear each other’s burdens. For this purpose, the Islamic banking industry operates differently to the western system and caters to the needs of its religious followers. The South East Asian insurance and reinsurance market hosts a diverse range of ideological elements which effect practice and operations. In the consideration of human security and the association with insurance and re-insurance, it must be noted that the statutory system of nations not only differs due to sovereign developments but also due to the ideological basis of these constructs. Islam in relation to insurance is particularly strong in South East Asian nations such as Malaysia where Takaful is increasing. As a multicultural nation, Malaysia hosts both the conventional insurance system as well as the Takaful system with the Takaful 1984 Act introduced to supervise Takaful activities no longer covered in the previous insurance act. Indeed the Takaful industry in Malaysia alone is headed by four pillar organisations including not for profit models and variations of cooperative models. From the example of Malaysia, it can be seen that South East Asia as a region balances many multicultural issues which also pertain to industries such as insurance and re-insurance. Whilst the SEA hosts both conventional and Takaful organizations, the response to risk management in the face of climate change and human security issues will be significant. Confirmed by neuroscience, humans are risk averse by nature with decision making in the face of risk determined by two important components; the rate of error and the predictability of the set outcome. Indeed where the outcome of the decision is ambiguous, the Orbitofrontal cortex becomes the key element in the process. Whilst ‘chance’ is seen in a positive light, risk has a negative connotation. In daily life, as well as in business, the assessment and management of risk ensures survival. Essentially, the assessment of risk allows educated decisions to be made. The realm of decision making greatly depends on the ability to foresee outcomes and the likelihood thereof with strategies often developed when information is lacking. However, when risks prove immanent, incalculable, or unavoidable, people become willing to accept risk. In the case of the insurance industry, risk is accepted once an external partner is willing to take the risk on the individual or company’s behalf. Whilst insurance ‘protects’ peoples and business from negative externalities of uncontrollable forces by replacing the loss with monetary assistance, insurance does not protect against the loss itself but acts as a compensatory mean. Indeed, insurance is not the shield with which to ward off the occurrence of such events, but rather limits the negative impact or ‘risk’ by monetary means. The basis of risk is probability; or the likeliness of an outcome occurring. This is crucial in decision making as the likeliness of a risk occurring will determine whether or not the person or organization will decide for or against the decision. Probability is based on the information given including statistics, data, personal information, trends, external factors and others. The probability of the risk occurring is then calculated from this information which demonstrates how high the element of risk is in the decision. The success of insurance as an industry depends on its ability to establish the probability of the risk and the subsequent likeliness of its occurrence as well as its outcomes. As insurance firms are a business, and not philanthropic organisations, the ability to establish grounds for insurance through probability is critical to their success. In the insurance industry risks can be categorized into pure risks, fundamental risks, or speculative risks. Pure risk relies on the possibility of loss with chance detracted as a variable leaving the optimal outcome to be status quo. Fundamental risks are large scale events which threaten people and property such as natural disasters. Indeed fundamental risks are a threat to human security. Most commonly insured risks pertain to a particular risk which has limited negative effects whereby the outcome only affects one of a number of people negatively. This is contrary to the fundamental risks borne by a group. In addition, the corporate sector houses additional risks including speculative or entrepreneurial risk. This is where the risk is often un-insurable as the risk depends on commercial decision taken and whether the subsequent transactions will result in a gain or a loss. To act in compensation of speculative risks, financial management tools such as hedging and forward contracts may be implemented with other business risks reduced through improved efficiency, adapting technology or diversifying the product base. Insurance is the promise of protection against potential future risk in exchange for a premium paid today (Swiss Re, 2004). Indeed, Van Cayseele (1991) draws comparisons between insurance and savings accounts from a consumer’s perspectives as both aim to ward off risks. Today, insurance can be sought for tangible as well as intangible assets including health, life, home, car, contents, business, and travel. The insuring party therefore takes a portion or the entire risk by terms of contract or insurance policy, in exchange for a premium or fee. In the event of the risk indeed occurring and negative outcomes prevailing, the holder of the insurance is entitled to claim the amount lost through the occurrence from the insurer according to the amount due as per the policy. This concept of insurance is common in North America, Western Europe and Asia dominating the market with customers interested in being ‘covered’ in the case of an unlikely, but costly, event occurring. As the insurance firm is made up of many clients, the laws of probability suggest that only a small number of these clients will be effected thus the funds collected by the insurance company through premiums being more than adequate to cover these costs. From this it can be seen that statistical analysis and calculation is crucial. In order to be able to insure against such risks, insurance firms prescribe conditions which must be met in order for a client to qualify for insurance. A key component of insurance is that the timing or occurrence of the loss is uncertain and therefore a risk; only predictable to a degree but not foreseeable and in essence random. According to Swiss Re (2004) the law of (large) numbers is a statistical principle suggesting that the more single or independent risks added to the reinsurer’s portfolio, the more stable the outcomes will be as diversification can provide a higher level of protection. As probability is used to calculate risk, insurance firms depend on the risk assessment of future losses. In order to do so, the likelihood of such occurrences is based on mass. The ‘Law of Large Numbers’ is used to calculate the expected loss of a large group, thus allowing a premium to be calculates when the risk is spread across the group. In the case of insurance, the more unique the risk or the more likely that it will occur, the greater premium be paid. While economists suggest insurance is, like any market, under the terms of supply and demand, occurrences are not necessarily independent (natural disasters) or unintentional (terrorism) and may indeed depend on the identity of the purchaser (health). Furthermore, Giarini (2001) highlights the concept of insurance as ‘market failure’ in relation to the notion of the perfect market equilibrium where all information is available as insurance firms base their considerations on uncertain future terms. For this reason, insurance has often been criticized as being discriminative (Palmer, 2007). In contemporary setting, this is particularly of concern with climate change and the denial of insurance coverage for regions of geographic locations ruled to be too high risk. The insurance market is a multi-billion dollar industry with competitiveness ruled by implications of supply and demand. Private insurance activities have increased at an estimated 5% per annum to address inequalities and vulnerabilities related to industrialisation, production, environmental issues, technological developments, personal vulnerabilities (unemployment, death, health, accident, retirement) and social vulnerabilities (political instabilities and state welfare issues) (Giarini, 2001). Today, it is common to see advertisement for insurance and the implement insurance brokers to seek the best deal. This ‘shopping’ for insurance has become commonplace whereby some nations prescribe insurance as necessary practice particularly in public institutions. Although the market is deregulated, in the interest of citizens most governments offer solid statutory base (such as through Insurance Acts) to ensure that the insurance holder as the weaker partner is on par with the firm or vendor. Insurance policies must be approved by regulatory agencies prior to being put on the market. The codification of insurance law on an international level was developed in the Americas and Western Europe post world war two and is today largely governed by the International Association for Insurance Law (AIDA) (Mango, 2003). In the case of insurance firms facing risk themselves, re-insurance acts as the means with which the firms can reduce their exposure to risk or loss. According to Global Reinsurance Highlights (cited in Swiss Re, 2004) it is estimated that 250 reinsurance entities are in operation globally with shareholder equity in the 40 biggest firms amounting to USD 249 billion in 2003. Furthermore, the top four reinsurance firms in 2002 held 35% of the global market share which is an increase from 22% in 1999 (Trump, 2002) The reinsurance industry is integral to the insurance market as it allows a larger capital base to spread risk (CEA, 2006). The re-insurer takes on the burden of risk (financial) in exchange for a premium and may chose to manage only single risks through facultative reinsurance or under contract terms through treaty reinsurance. In other words; reinsurance is the insurance of the insurance firms. Reinsurance provides direct or primary insurers, multinational corporations, reinsurance intermediaries, nations, and captive insurers with reduced volatility, improved financing, and access to additional expertise (Swiss Re, 2004). Reinsurance is purchased for a number of reasons. 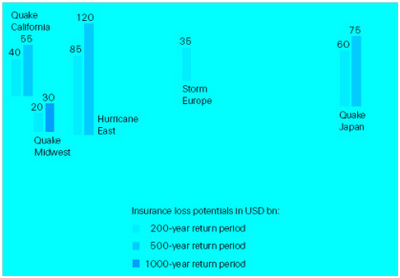 According to Swiss Re (2004) the degree of reinsurance purchased falls due to portfolios and exposure to catastrophic events (natural disasters), inadequate capital to diversify risk, specialization leading to higher risk, risks hold high exposure (aviation industry), life insurance with mortality or disability risk element are at higher risk, when entering new regions or developing new products, or to improve regulatory considerations through an improved balance sheet. Essentially, these reinsurance reduces the exposure to insolvency and provides balance for insurance issuers. Re-insurance is different to insurance as the parties negotiate at equal standing through contracts rather than in the case of insurance where the client or insurance holder is at a disadvantage to the insurance company. The reinsurance firm holds an advantage in the contract with the insurance entity stating that the reinsurance firm cannot be held responsible in the case of insufficient funds being available to guarantee support (Swiss Re, 2004). Therefore, it is of interest to the insurance firm to make sure the reinsurance firm is healthy and liquid. Furthermore, reinsurance firms can act globally in order to spread their risk. Naturally, reinsurance entities are not entirely free from risk and therefore invest significant time and resources in accurate calculation and management of risk. The risk capacity of reinsurers cannot be mitigated by lesser conditions than other actors in the capital market as the volatility of the reinsurance business is higher and therefore needs to carry higher returns to capture and retain the interests of shareholders (Trumpp, 2001). Risk management in reinsurance is the balance between underwriting, asset management and capital management. These implications are considered through modelling as seen in Figure 1. The main objectives of the underwriting process are the assessment of risk including terms and conditions, ensuring that the assigned limits are respected, implementing controls for a peak and accumulation risks, and ensuring appropriate wording and pricing (Swiss Re, 2004). According to Swiss Re (2004) underwriting examines prices, assesses and classifies risk for a certain segment, single risk or contract terms. The premiums received by a reinsurance firm are again invested. Asset management is responsible for delivering portfolio data to risk management where asset allocation corresponds with the characteristics of the liabilities also known as asset and liability management or ALM (Swiss Re, 2004). In asset management, accurate information is critical in order to assess both its value as well as its subsequent liabilities. Considerations in this process include currency exposure, payout patters, inflation, credit risk, changes in interest rates, equity, real estate prices and market movements (Swiss Re, 2004). Capital management is critical to reinsurance as the amount of capital and its management is determinant of reinsurance firm’s ability to meet its promise as well as its appeal to the primary insurer. According to Swiss Re (2004), capital is most critical for adverse situations regarding investment income, depreciation of assets, stock market slumps, economic downturns, or when payments exceed premiums. As in a business situation, capital acts as a shield against unexpected loss or cash flow issues. Capital management must balance the capital and risk of the reinsurance firm whereby a lack of congruence cues the increase the capital base or lighten the investment risks and underwriting (Swiss Re, 2004). Insurance and indeed reinsurance must adhere to certain principles which limit the insurability of a case or situation according to its associated risk. The risk criteria must be fulfilled in order for the risk to be insured based on assessibility, randomness and economic efficiency (Swiss Re, 2004). The ability to assess a risk is critical in order to quantify the probability of its occurrence and possible consequences as well as the estimated severity in order to determine the appropriate premium (Swiss Re, 2004). Randomness is also critical as the timing and likelihood of the event occurring critical to the insurance calculation as well as being independent of the will of the insured (Swiss Re, 2004). Regarding the premium, economic efficiency must be identified in relation to the risk (Swiss Re). Regarding natural catastrophes and associated insurance behaviour, the likelihood of the event occurring and the associated costs are based on scientific data and past record. Consequently, premiums are set according to this level of risk and the likeliness of the occurrence. In an area prone to certain disasters such as flooding, bushfires, storms or earthquakes, the premium for insurance may be higher and/or limited in coverage. Risks are accepted if they meet the limits of the set criteria as well as demonstrating the principles of insurance. The capacity or the maximum amount of coverage which can be offered by the reinsurance firm for a specific risk, depends on the portfolio and data with the higher the degree of risk, the greater the stringency on applying the limit (Swiss Re, 2004). In correspondence, accumulation refers the interdependency of risk, often the case in natural disasters or in the concentration of shares (Swiss Re, 2004). As discussed by Palmer (2007), insurers and reinsurers aim to be profitable thus setting premiums based on the probability of adverse events occurring. Whilst debate surrounds the assessment of individuals through categorising their case or on statistical discrimination, in the case of human security the ethical consideration is that of access. Palmer (2007) highlights that lack of access to insurance has social implications particularly if the government social security net does not provide a substitute suggesting that goods imperative to an adequate standard of living should not be entrusted in a private, commercial industry. The exposure to natural disasters corresponds to the location of the insurer, as some locations or geographical areas have a higher propensity for certain natural disasters than others. The assessment of this likeliness is based on past records and scientific data with reinsurance firms, such as Munich Re, having specialized departments dealing with this particular field. The exposure to natural catastrophes is growing due to higher population density and subsequent migration and urbanization as well as climate change (Swiss Re, 2004; Munich Re, 2009). The loss potential for the insurance industry is high in these instances and reinsurance is critical in managing these risks. According to Berz (2002) the propensity for natural disasters has dramatically increased in recent decades demonstrating clear risking cost trends. Berz (2002) notes that prior to 1987, only one natural disaster ever cost the insurance industry more than USD 1 billion and by 2002, 29 natural catastrophes have cost more than this precedent amount. Whilst highlighting the significant losses to the insurance industry, it must be noted that during this time the insurance market also grew substantially as well as changes in economic implications. It is estimated that claims arise from an estimated 600 natural hazard events annually with the increased costs a combination of increased insured liabilities and their values as well as increased occurrences in highly exposed areas (Berz, 2002). As the reinsurance industry is based on predicting the risk related to natural disasters, reinsurance firms are attuned to scientific research particularly regarding climate change. The purchase of natural disaster insurance and reinsurance products relates to the propensity for the catastrophe to occur as well as the financial position of the market with more affluent nations having a stronger reinsurance market (Klein, 2009). Due to the climate trends associated with global warming, reinsurance firms are reconsidering the terms of contract being careful in definitions related to time and randomness (Klein, 2009). The green industry trend has led reinsurance providers to develop new products for customers exhibiting green behaviour including decreasing carbon emissions and defensive climate change approaches (Klein, 2009). Policies and products are being, and have been, developed to address wind and solar energy production, efficiency renovations, carbon reduction and insurance for humanitarian emergencies as well as products for carbon market related risks (Klein, 2009). The UN Framework Convention on Climate Change (UNFCCC) considers climate change to be attributed either directly or indirectly by human action which may change the natural composition of the environment additional to natural climate patterns (IPCC, 2007). As reported by the International Centre for Technology Assessment (2004) the accumulation of greenhouse gasses in the atmosphere created through the combustion of fossil fuels is the driver of climate change effecting temperature, sea level, climate, biodiversity and geology. Whilst the CTA (2004) focuses its definition of climate change more so on human behaviour as a driver, the IPCC (2007) suggest climate change, whether due to human behaviour or natural patterns, can be identified due to variability of the mean as measured over a period of years or decades (IPCC, 2007). Subsequently, climate change infers issues in health, biodiversity, agricultural production, social movement and migration patterns as well as economic and political implications (Schwartz & Randall, 2003). The IPCC (2007) suggests that the future of climate change and its subsequent impacts on the social, environmental and economic capacity of the world is clearly related to greenhouse gasses and their effect on temperature. Subsequently, IPCC (2007) temperature forecasts include the scenarios of whether greenhouse gas emissions will remain at the level seen in 2000 (best estimate 0.6*C increase), intermediate population, economic growth, and local sustainable development efforts (best estimate 2.4*C increase), or rapid growth coupled with new technologies and fossil fuel intensive activities (best estimate 4.0*C). The IPCC (2007) estimates the following future impacts of climate change as exhibited in table 1. The acknowledgement of climate change resonates a message of social, economic and political issues currently debated with critical future implications. Climate change debate in the past decade has moved from the crusade of left-wing minorities and environmentalists to key industry bodies. The reinsurance industry is sounding a warning bell as it describes the economic and social implications of climate change for the industry. As described, reinsurance is based on calculations, statistics and data to manage risk effectively, contrary to the whimsical connotations often associated with climate change debate. In 2005, the total fatalities due to natural disasters were 97 000 with a total loss of USD 230bn in losses. Notably, the series of hurricanes in this year accumulated to USD 170bn with the Gulf of Mexico’s hurricane Katharina creating USD 135bn in damages (Swiss Re, 2005). The majority of financial losses related to insurance and natural disasters are in high density areas, particularly in industrialized nations with a greater number of valuable property assets. The estimated insurance bill for 2050 is expected to exceed £200bn due to climate change related extreme weather conditions and rising sea level (Brown, 2001). The predicted global losses are related to the increasing frequency as well as intensity of natural catastrophes with the sum of these events holding the potential to damage the insurance industry as well as having significant liability costs for nations (Berz cited by Brown, 2001). As noted by the Association of British Insurers (2009), the economic implication of climate change on the insurance and reinsurance industry has the potential to effect the global economy. Whilst the insurance market aims to cater to the needs of insurance holders by expanding their offers, the impacts of climate change would indeed see a reduction of insurance offers or insurance at much higher costs due to climate change potentially increasing the severity and frequency of natural disaster risks and subsequently equates to increased losses (ABI, 2009). With primary insurers taking on higher risk, a greater call well be made for reinsurance. However, as these funds are also based on capital, they are not free from economic burden. The implications for reinsurance are primarily fixated on financial loss. As an industry, financial loss on a large scale will have strong implications for the global economy (ABI, 2007). As reinsurance is not obligated to pay but rather is based on promise, the ability of the reinsurance firm to do so greatly effects the primary insurer (Swiss Re, 2004). This infers health, business and investment, property, social, political and economic considerations will subsequently be effected. Although investment is often thought of in a private sector, it must be noted that reinsurance also caters to the interests of public sector. Climate change poses a problem for reinsurance not only due to the possibility of economic loss but also due to issues relating to risk calculation, underwriting and forecasting. Further implications include changes to premiums, having to decrease offers, changes in the relationship with certain regions or insurers of that area, changes to investor relations and changes to country risk management and subsequent no-go zones. However, it can be seen in the case of micro-insurance and country risk management, climate change creates both risk and ambiguity with a possible associated increase in premiums and decrease in reinsurance products as well as proposing opportunities (Swiss Re 2009). The fear in regards to climate related issues as well as the increased risk creates both opportunities and threats for the reinsurance industry. Country risk management sees reinsurance manage the economic, financial, societal, political and environmental risks through an ‘all-hazards approach,’ citing climate change at the forefront of risk considerations and economic imperatives (Swiss Re, 2009). The argument of the reinsurance industry is that risks, particularly in globalised contemporary society, does not halt at national borders with typical risks associated with country risk management including natural disasters (storms, floods, earthquakes, droughts), health issues (pandemics), war (including terrorism), public and corporate assets, infrastructure risks, private property and food and energy security (Swiss Re, 2009). The economic argument prevails with Swiss Re (2009) highlighting that in 2008 only USD 50bn of USD 225bn in global economic losses due to natural or man-made catastrophes was covered by insurance with governments, businesses and the private sector paying the losses which occurred. This leads to higher debt, the need to raise taxes, deferred investment, decreased investment, and higher debt, all of which according to Swiss Re (2009) can be mediated through country risk management. Swiss Re (2009) proposes risk mitigation and risk transfer. By shifting the economic impact from post-catastrophe to pre-catastrophe by encouraging government investment in risk mitigation as a pre-emptive measure dealing with the economic impacts of disasters in the long run will be more financially viable. However, as not all catastrophes can be mitigated, thus risk transfer allows the securing of funds before the event through reinsurance or capital market solutions (Swiss Re 2009). This can be developed through government funds where the reinsurance firm will make capital immediately available if the catastrophe meets the set criteria, for programs for charity associations, or in association with the World Bank. The Asian market for re-insurance has grown dramatically in the past decades as the third largest market region after North America and Western Europe (Swiss Re, 2004). South East Asia has been particularly marked with change in the past decades with economic rises and falls, industrialization, urbanization, a change in socio-economic conditions and political issues. The increase in reinsurance in the South East Asian market is in relation to legislative changes as well as through the increased number of international primary insurers and reinsurers (Banks, 2010). Also, the South East Asian market has been more resilient in the face of the economic downturn than the two other key insurance markets, namely North America and Western Europe, as well as having a more fragmented and less saturated market than its northern neighbours (Banks, 2010). However, the South East Asian region also carries a high propensity for disaster with typhoons, earthquakes, floods and droughts all examples of common natural catastrophes for this area (Guy Carpenter & Co., 2006). Commenting on individual nations in the South East Asian market AON (2010) noted that international insurance agents have moved into the region in the past two years and that the market has not changed dramatically regarding renewals. Indeed, nations which had higher rates of renewal (such as Indonesia) were the nations which had been exposed to natural disasters in the past year (AON, 2010). Another characteristic of the South East Asian market is that although disasters occur at a large scale the cost is rarely as high as in the North American or Western European markets. For example, Typhoon Ketsana in Vietnam and the Philippines in September (645+ deaths and 7.4million+ claims) only amounted to insurer loss estimates of USD 260mn and economic loss estimates of USD 1.03bn (AON, 2010). In contrast, severe weather during July in Switzerland and Austria (11+ deaths and 5,000+ claims) amounted to an estimated insurer loss of USD 1.25bn and an estimated economic loss of USD 2.5 bn (AON, 2010). According to Swiss Re (2010) Singapore is currently the regional leader in South East Asia regarding reinsurance and in particular country risk management. Singapore has a ‘Whole of Government Integrated Risk Management’ framework (WOG-IRM) which is considered best practice as it redresses inequalities, helps address gaps in risk management, and identifies risks which would otherwise go unnoticed. The impact of climate change on South East Asia varies as the region’s diverse geography includes the archipelago nations, coastal nations, and landlocked areas (see Figure 4). The IPCC (2007), notes climate change as having a significant impact in the South East Asia and the small islands of the pacific region. This region has experienced change in temperature with an increase in temperature between 0.1-0.3*C per decade (1951-2000) as well as changes to precipitation particularly in the Philippines and Indonesia (Manton et al., 2001, cited by IPCC, 2007). Flooding, droughts, changes in precipitation, changes in temperature, heatwaves and typhoons have all been noted to have increased in past decades (IPCC, 2007). Heatwaves were experienced mildly compared to other Asian regions through the increased number of warm days and warm nights however flash flooding and landslides obviously increased with cases in Vietnam, Cambodia and the Philippines (IPCC, 2007). Furthermore, abnormal droughts were experienced in the Philippines, Laos and Cambodia (IPCC, 2007). Between 1990 and 2003 the Philippines saw the number of Cyclones increase by 4.2 (PAGASA, 2001 cited by IPCC, 2007). Small islands are given special consideration due to their abundance in the South East Asian- pacific area and their vulnerability to climate change as well as their position in reinsurance. The small islands are characterized by the IPCC (2007) as being located in tropical latitudes, being of limited size, housing a small population and being openly exposed to natural forces and subsequently climate change, sea level rises and extreme events. In the Pacific Islands, where 50% of the population lives within one kilometre of the shore, the rising sea level, storm surges and erosion are very real threats to the environment, the society, and the economy (IPCC, 2007). The pacific islands of Tuvalu, Kirribati and Palau are already trying to adapt to, or rather escape from, the implications of climate change and are expected to be followed by others (ALP, 2006). As many small island economies are based on natural resources, the effect on marine life and the related fishing industry is critical in the survival of the island populations (IPCC, 2007). Further soil salinity, sea level rises, flooding and fresh water contamination will bring agriculture and self sustenance to a halt as well as predicted adverse effects on human health (IPCC, 2007). Furthermore, the tourism industry, particularly the leisure market, will suffer as a result of climate change due to lost resources, infrastructure, culture, water shortages and diseases (IPCC, 2007). The region comprises of 10 nations with diverse climatic conditions and susceptible to a range of climatic and geologically related catastrophes. These natural disasters include earthquakes, floods, typhoons, tsunamis, droughts, volcanic eruptions and storms. As indicated by the IPCC (2007) the diverse geography of South East Asia including coastal landscapes, low lying islands, fault lines, rivers, mountains, and volcanoes puts this region at strong risk of the possible negative implications of climate change (Guy Carpenter, 2006). The geographic division of the region can be considered in terms of the archipelago, coastal and land locked countries. The archipelago includes Indonesia, Singapore, the Philippines, Brunei, Malaysia, and East Timor whilst Cambodia, Laos, Vietnam, Thailand and Myanmar are considered the South East Asian mainland with Laos a notably landlocked nation. For the purpose of this paper, some consideration is also given to China and Japan as well as the pacific region due to the geographic proximity of these nations and their considerable interrelations with South East Asia. Compared to the global insurance and reinsurance markets, Asia has a relatively low insurance penetration with areas such as China seen as upcoming markets (Thumpps, 2002; Guy Carpenter, 2006). In the case studied examined, it may be noted that insurance coverage and the demand therefore, is strongly correlated with the ability of the market to afford such a product. However, as noted by AON Benefield (2010) this has not halted the industry with key players having entered, and successfully remained, in South East Asia in the past decade. Due to the political structure of some South East Asian countries along with their propensity for natural disasters and the low socio-economic development rate, governments are often the main source of mitigating their financial risks particularly with small primary insurers whereas larger primary insurers choose international reinsurance firms. The regional reinsurance market of Singapore provides greatest capacity of support in South East Asia. Consisting of Laos, Cambodia, Thailand, Vietnam and Myanmar, the South East Asian mainland is climatically affected by a combination or coastal threats as well as land based issues. As noted by ASEAN Leaders’ Statement on a Joint a Response to Climate Change (2010) the Nations Framework Convention on Climate Change (UNFCCC) and the Kyoto Protocol (2009) are acknowledged as the legal instruments of the international community to address climate change. The goals of the leaders include moving toward a global solution for climate change as well as ensuring South East Asia’s resilience to climate change (ASEAN 2010). Concerns for South East Asia in relation to climate change are high due to the diverse levels of development in the region as well as the dependency on natural resources. The mainland area is particularly concerned by the possible effects of increased extreme weather conditions such as cyclones, storm surges, changing coastal conditions, temperature shifts (such as the effects of melting glaciers in alpine regions on the river systems), precipitation and flooding. Of particular concern is the Mekong region of the South East Asian mainland with the combined impacts on Vietnam, Laos, Cambodia, and Myanmar (Swiss Agency for Development and Cooperation, 2010; ASEAN, 2010). Further, the statement highlights the need for detailed information, climate change assessments and cooperation (ASEAN, 2010). The Mekong Region has received international attention in recent years particularly due to cyclone activity, the impeding danger of water based diseases through flooding, the significant population density and the calls for regional and international cooperation for socio-economic development (Swiss Agency for Development and Cooperation, 2010). The Mekong Region is considered one of the fastest growing economic subregions yet this growth is partnered with its vulnerability to economic shocks and negative repercussions associated with development challenges Asian Development Bank (ADB), the World Bank, and the Mekong River Commission (MRC), ASEAN, the United Nations Economic and Social Commission (UNESCAP) and various state aid programs sharing an interest in the regions sustainable development. Climate change and the rise of extreme weather events is a critical consideration for the region particularly due to the dependence on natural resources and economic developments synonymous increase in energy consumption (AusAid, 2007). The implementation of development strategies may be impacted by climate change with the developed ASEAN nations urged to assist their developing regional neighbours as the access to, and sustainable use of natural resources is critical the Mekong Region’s success (ASEAN, 2010; AusAid, 2007) A central issue to climate change and the impact on the Mekong Region is the lack of information on current climatic conditions and future implications related to climate change. It is estimated that particularly Vietnam and Laos will be impacted by changing river conditions and precipitation (increase or lack of) due to the dependence on the Mekong River system (AusAid, 2007). Furthermore, the economic development of the area will consequently impact the region’s environment. 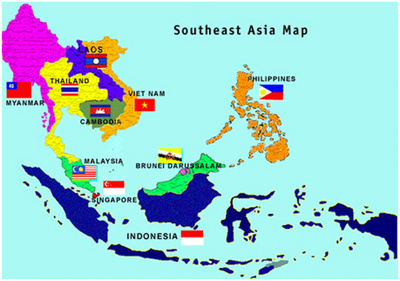 The archipelago of South East Asia includes Singapore, Malaysia, Indonesia, Brunei, East Timor and the Philippines. These island nations vary greatly in their level of development and population density although their coastal-island geographic unites them in their vulnerability to climate change and changing environmental conditions. As noted by SwissRe (2010), Singapore’s proactive approach to climate change and development is considered best practice for country risk management by the reinsurance industry. The disparity in development in South East Asia calls for the various neighbouring countries to assist one another in a cooperative effort to develop the region’s resilience to climate change (ASEAN, 2010). Environmental sustainability, management of natural resources, and regional cooperation are integral to the success of the region (ASEAN, 1997). Indonesia’s pacific location places the nation of small islands at the cusp of global warming implications through rising sea levels and storms as well as in a hazardous earthquake zone of the Sumatran fault. Between 2009-2004, Indonesia was hit by at least one devastating earthquake in its region annually with further quakes expected in the future. These off shore earthquakes are known as tsunami triggers with Spranger (2009) demonstrating the implications of such geological occurrences in his assessment of the 2009 Pandang earthquake. Spranger (2009) cites the humanitarian catastrophe as being a result of incomplete evacuation plans, poor reconstruction of buildings after previous major earthquakes, and lagging building and construction regulations. The insured losses amounted to less than US$ 100ml, making it the most expensive to date in Indonesia however the amount is trivial compared to the death toll and loss of livelihood with the poorest victims lacking financial protection in its most basic form. Again, insurance is a privilege of those who have the financial means to secure themselves, which in Indonesia are only a limited segment of the population. The insurance industry has the know how to address this issue and collaboration is needed in order for future victims to be financially protected (Spranger, 2009). The Indonesian reinsurance market in 2009 was rather uneventful, apart from losses associated with the Padang earthquake (AON Benefield, 2010). The main area of reinsurance in Indonesia is in business with companies reviewing catastrophe coverage and increasing the capacity as well as a significant increase related to fire risk (AON Benefield 2010). Furthermore, the revised earthquake tariff to be introduced in 2010 will see an increase in costs for earthquake coverage in certain areas (AON Benefield 2010). Suggestedly, these adjustments are related to the changing climatic conditions and the need to change habitual calculations. Although strictly speaking not considered as part of South East Asia, due to the large geo-scape of the country and the effects of its economic movement and participation in the reinsurance industry, China is mentioned in this context. China as a market for reinsurance has enormous potential as the direct insurance market is largely untapped suggesting potential for future sustainable growth, particularly when considering its complex risk environment including the propensity for natural disasters, industrialisation, high metropolitan population density, urbanisation, and increasing values (Thumpp, 2002). The reinsurance industry also holds a significant interest in China, but the interest in this area is also influenced by the current and future implications of climate change. China’s wide and diverse terrain is susceptible to varied climatic conditions including flooding, sea level rises and earthquakes (IPCC 2007). China’s extensive waterways have long been a source of life and livelihood, however the changing climatic and geological conditions associated with climate change are expected to alter the current state of this relationship. According to the IPCC (2007) the Yangtze Delta will be effected by geological and climatic effects leading to a 0.5-0.7m sea level rise by 2050 (above estimated global average). Furthermore, increased flooding during the summer months are predicted in the lower- mid reaches of the Yangtze River along with the sedimentary Huang He River also posing potential flood risks (IPCC 2007 cited by Munich Re, 2009). The flood plains are popular settlement areas and home to significantly large populations. In addition, the level of precipitation in areas such as Shanghai also presents a significant risk particularly to property and business with such experiences mirrored across the country. Although China has a high predisposition for natural disasters, the level of insurance is limited. According to Munich Re (2009), the ten largest natural disaster events since 1980 amounted to an aggregate loss of US $135bn, however insurance losses only accounted for 1-2% of this sum. To mitigate losses related to torrential rain and flood damage, Munich Re (2009) acknowledges that forecasting and therefore protection is extremely difficult. Whilst the state authorities recognize the necessity for flood prevention and act accordingly, true risk prevention is far from certain. A more destructive force than flooding are earthquakes with China having a reputation for intense and deadly quakes (Munich Re, 2009). Although the earthquakes are sporadic, the highest hazard propensity is in western China and the bordering Himalayan region. Furthermore, the country is ravished by the annual Typhoon season which predominantly effects the southeast provinces. In calculating probable maximum loss (PML) the insurance industry focuses on China’s economic centre where the hazards are high and the potential for loss are economically significant. Notably, these industrial centres are core business areas ensuring the continuation of the Chinese economy including the areas of Beijing, Tianjin, Guangzhou, Shenzhen and Hong Kong, the Guangzhou metropolitan area (Munich Re, 2009). In relation to typhoons, only 5%- 20 % of the estimated total losses related to these natural disasters are insured. China’s insurance market is rapidly growing in metropolitan areas, however the demand for this product is limited to those who have the economic means to partake (Munich Re, 2009). China’s socio-economic disparity sees a stark contrast between the growing demand of the affluent urban mid to upper class in contrast to the hampered rural areas or lower socio-economic groups. Whilst Munich Re (2009) suggests that the insurance industry is indeed growing faster than the economy itself, the percentiles previously noted regarding insured losses in the case of natural disaster suggest that insurance is a privilege. Contents, third party and business related insurance are still relatively unknown with life and health insurance becoming more common place. In a culture which focuses on the central family unit and the role of government in taking care of its people, insurance has borne cultural hurdles in entering the market. Essentially, risk mitigation is the role of the family group and the authorities rather than by individual case as seen today as a result of rising incomes, social insurance reforms, health care system changes, and private pensions (Munich Re, 2009). Although the IPCC (2007) suggests Japan’s cost is more protected that that of its South East Asian neighbours, Japan has a high propensity for natural disasters given its pacific location in proximity to fault lines as well as its unprotected island landscape making it a target of typhoons. In the 1990s, Japan suffered from the highest number of sequential natural catastrophes in recent history with 2004 being the most significant year of the past decade due to the occurrence of 10 typhoons as well as the Nigata earthquake (Guy Carpenter, 2006). Japan is also subjected to flooding, volcanic eruptions, tsunamis and winter storms. The 2004, typhoons amounted to USD 6bn in insured losses and USD 600 mn in the Nigata earthquake (Guy Carpeter, 2006). The high population density of the island nation, high propensity for natural disasters as well as the its socio-economic wealth in comparison to some of its South East Asian neighbours demonstrates a different aspect of the SEA reinsurance market. Property policies provide protection from some, but not all natural disasters with earthquake shocks or fire following an earthquake notably absent (Guy Carpenter, 2006). This is redressed through the Earthquake Fire Expense Insurance (EFEI) which provides coverage for small expenses caused by fires after the earthquake (Guy Carpenter, 2006). Residential earthquake insurance is administered by local primary insurers with provisions made by the Japanese Earthquake Reinsurance Company and Japan’s largest domestic insurer, TaoRe (Guy Carpenter, 2006). The current level of earthquake coverage taken by policy holders is at 37.4% (Guy Carpenter, 2006). The Japanese market has a higher rate of insurance, and subsequent reinsurance than its neighbouring South East Asian countries due to its economic advantage and high risk environment (AON Benefield, 2010). Indeed, the Japanese market was the only insurance market to remain stable growing during the period of the financial crisis particularly in life variable annuities and retirement (AON Benefield, 2010). The number of earthquake capacity purchases made between 1996 and 2003 demonstrates a strong growth trend (Guy Carpetner, 2006). Products are continuously developed for this market due to the growing demand, and the financial ability to purchase. 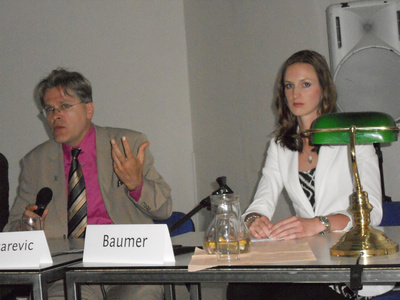 In 2009, the US National Association of Insurance Commissioners issued a mandatory requirement that all insurance companies disclose the risk the face in relation to climate change yet this was changed to voluntary participation with the association stating that the data from the survey would remain confidential (NAIC, 2010). Beyond the potential losses which could be incurred in relation to climate change, the reinsurance industry must also consider its legal liabilities (Klein, 2009). With class action lawsuits having occurred in gas, oil, mining and chemical companies in relation to environmental damages, the reinsurance industry could also be effected by such suits (Klein, 2009). As Klein (2009) points out, reinsurance has further liability issues due to its relationship with investors and portfolio diversity suggesting plummeting stocks due to incongruent policy or fund behaviour as case for legal implications. Further, professional liability issues related to lack of information disclosure could also provide case (Klein, 2009). A recent study of the Economics of Climate Adaption Working Group (2009) Noted that enough data is available to base decision making on cost efficient adaption measures citing the economic value at risk to due to climate change risk being 1-12% of GDP by 2030 at today’s climate or 1-19% of GDP by 2030 in accordance with high climate change. An estimated 40-65% of identified risk associated losses may be averted with insurance measures holding the potential to address low-frequency events with high severity (ECA Working Group, 2009). In summary, economic losses as a result of natural disasters in Asia 2009 amounted to close to USD 17bn or 0.07% of GDP, most of which would be uninsured (ECA Working Group, 2009). Of those who perished in the catastrophic events of 2009, an 9400 lived in Asia amounting to over half the total number of victims. Of the natural catastrophes which occurred, typhoons claimed the largest number of lives with Typhoon Morakot in Taiwan, the Philippines and China claiming 900 victims followed by Typhoon Ketsana in the Philippines, Vietnam, Cambodia and Lao resulting in 850 missing or dead. The implications for the reinsurance industry regarding climate change are summarised as housing the negative consequences associated with incalculable risks and subsequent losses as well as the implications for future liability issues. However, there are also significant human security implications regarding climate change and the reinsurance industry which are most prevalent, currently, in the South East Asian no-go zones. Human security, along with human development, surpasses traditional notions of security to comprehensively include environmental, political, social and economic aspects and is associated by the increasing role non-state actors play (Shaw, 2004). In the case of environmental security, the threat thereto is not isolated to a particular individual or community, but rather an intensified affected core with global repercussions. Risk management, as in the case of insurance risk, credit risk, market risk, and operational risk, is the cornerstone of re-insurance with underwriting controlling the limits of insurance and identifying information such as in the case of natural catastrophes and environmental threats (Swiss Re, 2004). Re-insurance is not a philanthropic concept or support network, but rather an industry interdependent with the global economy and market trends whereby weakened global financial markets and investor pessimism are critical factors (Thumpp, 2002). Human security and human development have been strongly advocated with a particular surge since the 1990s as the influence of non-state actors becomes more prominent (Shaw, 2004). Fernandes (2004) pertains the changing political and economic rhythms in Asia to globalisation and the rising middle class with economic prosperity, improved standards of living and education contributing to more democratic political movements and proactive behaviour in uniting the modern and the traditional. However, the South East Asia region still houses human security issues related to civil unrest, welfare, political, social and economic issues. With the summary aim of the Millennium Development Goals being to halve poverty by 2015, the importance of addressing environmental issues and their social implications are critical particularly in South East Asia’s developing no-go zones which would see a major step back in the development process. The environmental sustainability index benchmarks nations on environmental stewardship in aim of establishing tools for environmental decision making and policy development, presenting an alternative source of measurement to GDP and the Human Development Index, and as an international benchmarking mechanism (ESI, 2005). Essentially, the higher a nation’s score the better their position for favourable future environmental outcomes with high scores often seen in nations with a low population density, economic prowess and a stable, quality government (ESI, 2005). In the case of South East Asia, the ESI cluster analysis splits the region in different groups including Group 2 (Moderate system and stress scores; high vulnerability and low capacity; above average stewardship) and Group 7 (Low system score; moderate stresses, vulnerability, capacity and stewardship) (ESI 2005). Interestingly, the report shows no distinct correlation between the development of a nation and its score. Whilst this report demonstrates the stewardship of different nations and provides somewhat of a benchmark, the disparity in the South East Asian region demonstrates the diversity in environmental issues and their importance to policy makers. The Commitment to Global Development (CGD) Index examines the efforts of nations to assist human development and human security by particularly examining the relationship between developed nations and developing nations. Notably, current members of the CGD Index are developed western nations with the CGD Index data demonstrating Australia and New Zealand to be the prominent players in the south east asian region. Suggestibly, this is due to the pacific proximity of the nations as well as the development status of Australia and New Zealand (CGD Index,2009). The CGD Index indicates that developing nations are at greatest risk with economic imperatives prevailing in the assessment threats, education and proactive initiatives. As highlighted by the United Nations Development Programme Disaster Reduction Unit (2004), the hindrance of development due to disasters has implications for the development programme and the ability of the participants to achieve the set Millennium Development Goals unless risk prevention measures are undertaken. These include the humanitarian and economic implications of natural disasters with the humanitarian community active in response measures rather than through policy development and proactive initiatives (UNDP, 2004). Indeed, the UNDP Reducing Disaster Risk Report (2004) suggests disaster risk as being an unresolved problem of development and that it is the challenge of the global community to address these risks. In particular, natural disasters and the accumulated risks in relation to climate change need the response of the international community to address, as well as the balancing of the reinsurance industry in ‘country risk management,’ public authorities, and mitigating the development of no-go zones. The nations of South East Asia are classified predominantly in Disaster Risk Index groups 7-4 with 7 indicating the highest disaster risk. Furthermore, the region is surrounded by other high risk areas (Figure 3) (Peduzzi, Dao, Herold & Mouton, 2009). Essentially countries are grouped in their geographical exposure to natural disasters, the risk level of these disasters occurring as well as the severity of the effects on the population. The Philippines, although commended by their ESI efforts, are considered as a category 7 group nation therefore having the highest quote of risk in South East Asia (Peduzzi et. al., 2009). The Catastrophe Risk Evaluating and Standardizing Target Accumulations (CRESTA) is an independent organisation focusing on uniform global data on aggregated exposure for risk control and modelling specifically for the insurance and reinsurance industry. As an independent body, the information collated, processed and provided is publically exhibited and predominantly used by the insurance and reinsurance industries. CRESTAzones are a visual depiction of risk related regional data providing information on exposure in specific areas. In a CRESTA survey conducted in 2009, 51.2% of respondents belonged to the reinsurance industry demonstrating the value of CRESTA in risk assessment with 68.% of respondents doing business globally and an additional 6.1% specifically in Asia (CRESTA, 2009). According to respondents, the CRESTAzone data is used for inhouse accumulation control and risk management, for pricing tool input, to send exposure data to reinsurance firms and for geo-coding (CRESTA 2009). Recently, CRESTA has indicated the possibility of updating this information as regional figures have changed and the industries seek more detailed risk exposure descriptions specific to areas which will result in a high and low resolution information display (CRESTA, 2009). However, critique suggests that the two options will create confusion in analysis as well as limited data available in some areas remaining a key issue (CRESTA, 2009). Noting the introduction of the earthquake tariff according to Aon Benefield (2010) and the CRESTA (2009) adjustments, it may be suggested that the new data collation efforts and price adjustments are not only due to economic concerns but also as responses to climate change and disaster risk management. The reinsurance industry, particularly internationally, is marginally transparent with the safety net not extending to all areas. According to Swiss Re (2010) most nations in South East Asia would not qualify for reinsurance as they are dealing with basic welfare issue including poverty, food and water issues as well as security concerns. Notably, emerging or developing economies are often less sophisticated regarding risk management whilst holding the highest vulnerability to natural disasters due to high population growth, environmental degradation, and negligent urban planning (Swiss Re, 2010). Subsequently insurance markets in these areas are often underdeveloped and therefore not at the capacity for reinsurance to enter the market. Further issues are related to lack of data and risk awareness. Consequently, the lack of reinsurance in these areas is not due to climate change itself, but rather risks exacerbated due to these climatic conditions as can be seen in the example of India which, with 40mn hectares of flood prone, whereby 8% of the total land mass is prone to cyclones and approximately 68% of the area is susceptible to drought, cannot receive reinsurance (Swiss Re, 2010). For the purpose of this paper, the plight of the pacific region also be considered provide case for subsequent replicas in the South East Asian region. Although international data such as the Environmental Sustainability Index, the UNDP (2004), the IPCC (2007) and the CGD Index have indicated that South East Asia is at risk of similar environmental challenges, there has been limited discussion or publications in this area. For this reason, the data of noted international bodies, research institutes, non-government organisations and government publications will be used to examine this issue. ‘No-go zones’ are specific geographic regions considered too high risk for reinsurance and subsequently insurance companies to insure. The discussion of no-go zones is limited, stakeholders providing limited data and refraining from the definition thereof. Thus, the plight of these areas is dependent on effective fiscal policy and a strong national welfare system to mitigate risks associated with climate change. The series of ‘no-go zones’ demonstrates the economic imperative and business rationalism which conducts the insurance, and indeed protection, of regions. Although not illicitly expressed, climate change is producing no-go zones for the reinsurance market in which areas pose too high a risk with minimal to no economic return or too great a liability. The impact of climate change on the reinsurance market has thus far seen an increase in purchases and growth in the South East Asian market; however the risk of disaster is only economically viable if the laws of probability ring true. As discussed by Klein (2009), climate change’s greatest current threat to the reinsurance industry is the impairment in data calculation and effectively assessing the probability and associated estimated scale of the risk. For the purpose of this paper, no-go zones are considered geographic areas, regions or sovereign nations with an incalculable or disproportionately high insurance risk due to their high propensity for disaster, high risk for humanitarian loss, and at risk of becoming unliveable. In the case of the South East Asian region, particularly in coastal areas and islands, the ‘no-go zones’ will have a profound effect on human security as inhabitants to seek protection and welfare support. From this it can be suggested that environmental peril may be grounds on which seek and be granted asylum. This may lead to new migration trends and subsequently strain inter-regional relations, immigration policies and welfares systems as well as setting precedents for future ‘no-go zones’ and other un-protected areas. For example, certain island nations of the pacific are scientifically assessed to be sinking meaning climate change is leading to increased natural disasters and negative effects making the area ‘uninhabitable.’ In response, reinsurance firms will not be able to support primary insurance suppliers as the risk is either too high making the product unaffordable or the key insurance criteria cannot be met meaning the product cannot be supplied. Assuming the island nation has a fragile and limited economy, this has direct consequence with the ability for the region to be economically viable and be socially sound as the economic imperative ensures health services. In consequence, three options are available to the island nation: to seek international aid, to stay or to go. Notably, all three possibilities significantly affect the human security of inhabitants. Currently, national initiatives may be supported through international aid or reinsurance as seen in the example of Swiss Re’s Country Risk Management product. However, this product will only remain as long as it is economically viable due to the commercial nature of the reinsurance industry. Critique towards the industry is withheld, as it consists of commercial enterprises rather than public institutions. However, when the financial safety net is no longer on hand, these cases of missing funding will become humanitarian issues for the international community. According to Paduzzi et al. (2009) there are a significant number of island nations with insufficient data to acquire an accurate analysis however that is not to say that these nations are all no-go zones. Rather, it illustrates the difficulty in evaluating all regions in South East Asia region. The implications of no-go zones are difficult to estimate due to the lack of official data available on these actual regions complimented by the fact that no official ‘no-go’ zones have been declared for public debate. Understandably, the declaration of no-go zones would have significant immediate political implications. To estimate the repercussions of the regions officially declared ‘no-go zones’ and the currently estimated consequences of climate change ringing true, issues of human security including welfare, security and protection and migration are core implications. Migration is one of the key issues in the development of no-go zones and relates to the third cited option of ‘leaving’ which, depending on the circumstances, may result in mass exodus. For the south east asian region, the inhabitants of no-go zones will follow current migration patterns of moving, out of necessity, to other nations on hope of security, protection and a new beginning. In reference to the CGD Index, it can be seen that Australia and New Zealand hold the highest migration levels of listed developed countries in receipt of migrants for South East Asia (CGD Index, 2009). When considering Australia and New Zealand’s geographic proximity to South East Asia, the trade links, security, aid, and the overall high CGD indicators it would suggest that these nations would be the logically primary movers in the migration movement of the no go zone population. Furthermore, as categorised ‘developed nations’ with a lower disaster risk factor Australia and New Zealand would be first ports of call (UNDP, 2004; CGD 2009). In the case of migration as an option, it is assumed that the possibility of living in the no-go zone remains however the non-voluntary movement from this area would mean a case for asylum. Article 14 of the UN Declaration of Human Rights 1948 declares that all people have the right to seek and enjoy asylum in another country free from prosecution. In South East Asia, the inhabitants of no-go zones will indeed go somewhere. Climate change perhaps becoming the newest ground for asylum. This poses significant problems as climate change is a global issue, thus not the responsibility of a single nation or community suggesting that asylum free from environmental risk is the criteria for this status. Indeed, the plight associated with economic deterioration, infrastructure loss, and crumbling welfare systems as well as inadequate governance due to the inability to finance initiatives creates a hostile living environment. The no-go zones are set create climate change asylum seekers and orphans of global warming. (Australian Immigration Fact Sheet 61 - Seeking Asylum within Australia, Australian Department of Immigration and Citizenship 2009). The Australian Immigration Fact Sheet 61 also highlights that signatories to the convention are not obligated to provide protection to those who do not meet the stated criteria or who, “have left their country of nationality or residence on the basis of war, famine, environmental collapse or in order to seek a better life for themselves or their family.” Notably this specifically excludes environmental collapse or environmental refugees. The federal government’s recent policy paper ‘Our Drowning Neighbours’ is expected to see Australia move into a new direction of immigration policy particularly considering the harsh international criticism the nation’s immigration has received in the past decade. Additionally, it has been noted by the international press that Australia has indeed taken on refugees from nearby pacific islands. According to the CGD Index, New Zealand outgrows Australia in its migration policy in the South East Asian region and was markedly the first country to accept environmental refugees. It is expected that the pacific cases of Kirribati and Tuvalu amongst others, will set a precedent for environmental migration policy and will be replicated across the South East Asian region due to the number of island conglomerate and predominantly coastal landscapes. According to Peduzzi et al (2009) the South East Asian region boasts predominantly nations of the high risk category with many small island areas missing data and therefore undefined, similar to the pacific cases. Welfare is a key predicament in the case of no-go zones internationally. As noted by Swiss Re (2010), the level of development is critical in enabling reinsurance with basic welfare needing to be addressed prior to products becoming available. As the areas, regions or nations transcend from stable or in some cases even prosperous areas to deserted habitats, welfare is a ground for the population to move and the international community to be called to attention. The welfare issue in climate change affected areas, particularly small islands, include decomposing eco-systems, lack of fresh water sources, extreme weather events, and rising sea levels (ALP, 2006). In essence, the basic physiological needs cannot be met. The case for welfare issues depends on the starting point of the area, region or nation with welfare considered either a the responsibility of the state (often supported by reinsurance) or the responsibility of the individual (in the case of primary insurance). As examined, South East Asia hosts a great diversity in welfare standards often exhibiting distinct class systems therefore influencing the primary access to welfare. Welfare considers the quality of life by meeting physiological needs as well as education and healthcare with access thereto diverse in the region and again gapped by socio-economic strata. The process begins in an area where extreme weather conditions are becoming more intense or more frequent often disrupting development or economic activity (UNDP, 2004). Conversely, forms of agricultural production or natural resource dependent industries deteriorate creating economic and social problems. The government, depending on the region, may or may not act in response to such issues by using national funding, reinsurance products, or international aid. These issues lead to civil unrest as the population moves in closer proximity to remaining available resources, which in some cases will see a form of urbanisation leading to an eruption of civil unrest regarding resources and a deterioration of welfare due to lacking economic means and increased population density. The increased population density is expected to, see a strain on infrastructure and welfare systems such as healthcare with an increased population or spread of diseases (for example water borne diseases) or both. At this point, areas will start to become ‘unliveable’ with the propensity for risk too high for the reinsurance industry to support national governments with areas thus seeking the aid of the international community as it becomes a humanitarian issue. In the US Department of Defence Report (Schwarz & Randall, 2003), global future scenarios are depicted for the global community with examined country cases closest to South East Asia being Bangladesh and China, which are both predicted to be plagued by humanitarian issues due to lack of natural resources and famine (Schwarz & Randall, 2003). Furthermore, the issue of development and mortality in relation to high risk areas and regions with a significant propensity for natural disaster have been determined (UNDP, 2004; Peduzzi et al, 2009). 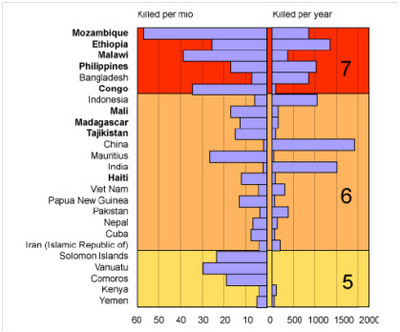 The 25 nations bearing the highest figures for disaster mortality, demonstrated in Figure 4, host numerous South East Asian nations. As outlined by the Australian ‘Our Drowning Neighbours’ (ALP, 2006) report on the plight of the pacific and the case of environmental refugees, the assistance of these people is not only in environmental interests and humanitarian obligation, but also for the welfare and security of Australia. Indeed, the fear of waterborne diseases and the incapacity to act methodically in addressing migration issues sees the welfare of not only the nations in plight but also the supporting nations to be of concern (ALP, 2006). Climate change presents a challenge to regional, national and human security with the potential to destroy development gains as well as to dramatically hinder future development as well as possibly destroying food systems, deteriorating living conditions and causing conflict and disruption (ALP, 2006; UNDP, 2004; Schwarz & Randall 2003). The security issue in South East Asia is to emerge strongest in 2020 when the impact of climate change on the region congregates and subsequently creates regional conflict (Schwarz & Randall, 2003). As civilisation is based on the ability of humans as a group to rely on the resources of their habitat to address physiological needs as well as provide elements with which to forage political, economic and social identity, the lack thereof proposes the disintegration of human security and subsequently of the population. In the case of no-go zones, the ability to maintain a mode of economic security is reliant on the combination of resource endowment, the supply and demand movements of the market, and indeed the assurance of future prospects. Here, reinsurance stands as an influential factor with a security needed for economic stability. This security of livelihood is integral to the ability of the sovereign state as an independent body. Human security is greatly influenced by the ability of the governing bodies of these risk imbedded areas to manage the needs of their populations. As the lack of economic progression leads to a decline in income and subsequently of national finance, the state comes to rely on reinsurance plans or foreign aid. As expressed, the reinsurance industry at such a late stage bears no interest in supporting areas which may cease to exist. The issue of protection is another key factor in security. Whilst the welfare issues associated with food systems and living conditions deteriorating cause civil unrest in dispute over resources, the threat to national security also exists (Schwarz & Randall, 2003; ALP, 2006). Schwarz & Randall (2003) suggest that disputes related to energy and food resources will replace the ideological conflicts common today although the nature of the conflict is debateable as is which weathers will surface as attackers and which as victims. In the case of no-go zones, the security issues will predominantly focus on regional human security issues as it is assumed these areas are not desirable by other nations due to the propensity for disaster and the possibility that these areas may cease to exist. However, the forced fleeing of the population to other areas will create civil unrest in the new vicinity due to increased population in contrast to the limited carrying capacity. The carrying capacity refers to the ability of the earth’s ecosystem to support the population with areas differing in their ability to meet these needs (Schwarz & 2003). In the case of no-go zones, the propensity for disaster decreases the carrying capacity of the area therefore threatening human security. As long as the carrying capacity of the eco system exceeds the population peace will remain, whereby the opposite would cause significant conflict (Leblanc cited in Schwarz, 2003). The reinsurance industry supplies financial support and advice to government or organisations regarding a wide range of risk issues. In the case of human security, two prominent concepts in the past decade include terrorism and disaster risk. South East Asia has a low reinsurance penetration with the reinsurance products in these areas prominently seen in the US and in the European markets (Guy Carpenter, 2006). The role of reinsurance in contrast to the responsibilities of government is continuously examined with fiscal policy often favoured over the commercial reinsurance industry, however it is also acknowledged that the lacking capital base makes reinsurance a player in the health equation with governments opting for fund pooling solutions particularly in areas of welfare (Dror, 2001). Country risk management is seen as a product with which nations can counter these risks through reinsurance to manage natural disasters, health issues, war, assets, infrastructure, energy, property and security (Swiss Re, 2009). These can be seen as consequences of climate change, however there is no insurance against climate change as such. Furthermore, the economic argument prevails with the financial implications of un-insured consequences falling on government, business and the private sector creating significant economic, political and social implications (Swiss Re, 2009). Essentially, reinsurance in the case of negative consequences due to the risks associated with climate change (such as increasing frequency or ferocity of natural disasters) secured by country risk management is a transfer of risk from the public sector to the reinsurance industry. Naturally, the reinsurance industry is a commercial sector which means that the interest in supplying reinsurance products must sustain a level of profitability. As discussed by Palmer (2007) there is an innate conflict in the notion of bestowing welfare and human security on the reinsurance as a commercial industry as these issues are clearly in the public sphere of responsibility. As the representative body of the population, it is the role of the government to ensure that the needs of the population are addressed. These needs are commonly addressed through legislative measures and fiscal policy, yet if the government does not have the sufficient funds or if the government is not trusted by the population, as often the case in developing nations, alternative measures such as reinsurance or foreign aid may be taken. In the case of no-go zones, reinsurance is no longer an option leaving foreign financial assistance and international financial institutions as the remaining funding avenue. However, as the no-go zone is considered uninhabitable and the region or state is expected to cease to exist, the willingness of the international community to provide financial assistance, particularly for redevelopment, is impossible. Furthermore, the economic impacts of debts have implications for the no-go zone as well for the supplying nation, which may lose the invested finance permanently. The role of the international community regarding no-go zones is mixed as currently there is no public consensus of this concept, however the role in regards to climate change seems obvious. In considering the pacific cases currently being discussed by the international community, the states as sovereign entities are focusing on reactive strategies including disaster protection structures, strategies to manage food and resource shortages, and migration policy to ensure that inhabitants have a safe haven once the area is indeed uninhabitable. As noted by the UNDP (2004), the focus of humanitarian issues by the international community in disaster risk areas focuses on post factum aid rather than proactive measures. Reducing disaster risk is considered of interest to the international community to due to the consequences it bears on development as well as further repercussions on the international realm including climate change policy, financing, international trade, foreign aid, and migration policy (UNDP, 2004). As the IPCC (2007)notes, south east asia is at the threat of climate change with the majority of these nations categorised in the top 25 disaster risk exposed nations (Peduzzi et al, 2009). The linkages with the international community have been integral to the development of South East Asia in recent decades particularly in relation to trade. The international community may support eachother through political and economic endeavours as well as through foreign aid, often in the form of loans rather than grants and is provided by either the private or the public sector (Mango, 2003). In the case of no-go zones specifically, the responses are mixed as the debate of whether climate change exists wages and if so, when, where and how it will be experienced. Political agendas and sovereign interests still outweigh the voices of such no-go zones which are notably smaller players and economically and politically seen as less significant in the international community. This ‘insignificance’ is affirmed through the lack of action undertaken to address these issues. Reflecting on the case of the pacific, proactive measures must be taken to address the possible consequences prior to their actualisation. In particular, the South East Asian no-go zones will have significant impact on the neighbouring nations in immediate vicinity having limited resources to effectively address the social, economic and political consequences. With Australia and New Zealand acknowledging the desirability of their nations, these states have noted that aid and migration assistance are not the only solution in addressing these problems with education and training programs implemented in the pacific to ensure the new population will be assisted in the integration process as well as not becoming an economic burden to their new host nations (ALP, 2006). However, the actions of the international community in response to climate change, the issues for change hotspots becoming no go zones, little international activity has come about. This can be seen in the leaders of international hotspots such as Darfur, Bangladesh, Tuvalu, Kirribati, and Palua seeking assistance in the international arena (UNHCR, 2009). In the assistance of the international community, the efforts are aimed at ensuring the inhabitants are able to remain in their country of nationality or residence through development aid, financial assistance, peacekeeping forces, or in the case of refugees in repatriation. No-go zones, however, become uninhabitable therefore the current strategies applied by the international community under the heading of humanitarian assistance must be re-defined with new policies developed to address this changed situation. In conclusion, the symbiotic relationship of climate change and reinsurance has a profound effect on the human security issues of South East Asia’s no-go zones. Whilst climate change has been disputed over decades, the international arena today leaves little room for discussion of ‘if’ climate change ‘will’ occur, and has been overrun by the commencing effects taking place. The role of international organisations in monitoring climate change, as well as the wealth of scientific literature, demonstrates the possible effects of climate change with current situations mirroring these predictions. In the discussion of reinsurance, it is evident that the commercial sector dedicated to business and private interests, has become the realm of public policy with government budgets and risk management efforts backed by reinsurance firms. The reinsurance industry is a case of supply and demand with changing environmental conditions providing an opportunity (China) and a risk with too high a burden to undertake (India/Bangladesh). As the industry moves to new catastrophe modelling systems, revised disaster risk indexes and an adjustment of risk zones, it is undeniable that climate change is affecting the industry and its risk calculation. Based on probability, the industry is cautious in its acceptance of risk, therefore adopting green initiatives and country risk management problems to cater to market demand. As demonstrated in the literature, there is ample scepticism for government’s reliance on reinsurance to safeguard human security, particularly as the reinsurance industry has enunciated its dedication to commercial and shareholder interests. As noted in the case of South East Asia, the climatic conditions hold a high propensity for natural disasters with the increased frequency and severity estimated as a consequence of climate change. The region’s diversity is exemplified through the best practice example of Singapore in contrast with the case of Indonesia and the lack of data on the smaller South East Asian areas. The region’s high population growth and diverse level of welfare as well as dispersed economic development demonstrates the difficulty in ensuring human security for the entire region. As noted, the marginally transparent safety net of reinsurance does not extend to all areas. The lack of adequate governance, reinsurance and international funding leaves a battlefield for no-go zones. In essence, perhaps an examination of the dependence on the reinsurance industry by sovereign states is to be examined, particularly due to the human security issues related to the emergence and development of no-go zones. As exemplified, human security issues relating to the development of no-go zones through the effects of lacking reinsurance and climate change include migration, security and welfare issues as well as the international community and the need to examine the role of government in this equation. Although human security is a sovereign issue, it is of international interest. In the parallels drawn between the current pacific cases, it can be assumed that South East Asia will experience similar issues in future decades leading to critical human security concerns by the states and region as well as the international community. In order to do so, it is recommended that the development of no-go zones foremost be publically acknowledged by the international community in order to create a context or pro-active cooperation rather than hoping to address the issue after the fact. Furthermore, the data collated on the South East Asian reinsurance market as well as on climatic change and human security issues in the area must be conducted in further depth. Critically, the dependence of governments on reinsurance must be reviewed. The cooperation of the international community is critical, however South East Asia as a region must first come to a level of consensus particularly due to the disparity in levels of development and human security issues within the region. This must be supported by policy development and proactive risk management. International law and policies enshrine the values and commitments of the international community however this law of consensus is subject to criticism due to the limited power it holds over the decisions of sovereign nations. Furthermore, the international sanctions employed in an attempt to force conformity to the prescribed laws by signatories are often seen to have ulterior motives and limited influence. In the case of human security, international policy has been developed, yet it is the responsibility of each community, state, and region to focus on their commitment in order to facilitate this concept on an international level. Intergovernmental Panel on Climate Change 2007, Contribution of Working Group II to the Fourth Assessment Report of the Intergovernmental Panel on Climate Change, IPCC Cambridge University Press, NY, USA. The re-insurance industry does not have the luxury of time in which to debate the ‘possibility,’ of climate change but rather to focus on the ‘probability’ of the consequences. Right now, the economic implications of natural catastrophes is 2-9% of GDP in aggregated monetized damage (1-1.5% for the OECD and 2-9% for the developing, non-OECD nations. With the cost of natural disasters predicted to rise exponentially in coming decades, the issue of human security is measured in economic terms. The economic effect of climate change is vague with popular measures of market costs, changes in quality of life, lives lost, species lost and variations in cost distribution and subsequent benefits. These costs are summoned into willingness to pay (the readiness of people to exchange their capital or income for improved human security) and willingness to accept compensation (the amount of compensation needed to ‘smoothen’ inhabitants to accept deteriorating conditions). In response, the RE-industry has moved to new catastrophe modelling systems, developed new insurance products, flaunted ‘green’ initiatives and created new defences against climate-related claims in order to analyse and more effectively assess the probability of risks and integrate problem solving mechanisms systems (including the so-called ‘No-go-Zones’).